Portrait painting is empirical. The artistic problem it presents is one that we can all envisage no matter how distant the time context where it occurs, and a great part of its fascination is due to the fact that it results from the interaction of two forces, artist and sitter, and not from the action of one. Portrait painting is a collaborative process, a relationship, perhaps even a contract, between two people. If, as Pope-Hennessy asserts, there is an artistic problem, then this problem has run parallel to the long history of the human portrait. Every portrait that is produced, whether painted, drawn, cut out or sculpted, requires both an artist, who is able and willing to take on the task, and a model, who is able and willing to act as a subject for this artist. The portrait takes place, so to speak, in the space between these two. Therefore, both the artist and the model are essential to the process. Both offer their services for the realisation of the picture, and both must make some critical decisions along the way. Nonetheless, it is the painter who decides how the model must sit, the way his or her head should be turned and whether there should be a full-face or three-quarter view. It is also usually the painter who decides, in discussion with the model, how the picture should be composed: whether it should reach down to the chest or be a half-figure portrait, knee-high, or depict the full figure. The style, too, is the artist’s choice, to the extent that a style can even be chosen. As a rule, it is the model who makes the first decision, because it is he or she that selects the portrait painter. At least, this is how it was in the time of Absolutism and the great princes. It is not necessarily how it is today. In practice, one does not select a portrait painter such as Jonathan Yeo. Not unless he has already expressed his desire to be chosen by someone that chooses him. For Yeo is currently one of Europe’s foremost and most sought-after in the genre. It takes time to be immortalised in the same way as portrait painters such as Diego Velázquez, Rembrandt van Rijn and Jean-Auguste-Dominique Ingres, but the implicit paradox of this genre is that those people who are chosen to be portrayed for our public museums and institutions, and therefore have to make time to sit for the painting, are generally the very people who rarely have enough time for such a time-consuming activity. The time of people like Kevin Spacey, Nicole Kidman, David Cameron and Tony Blair is just as limited as that of history’s great kings, princes and military leaders. It is not just the model who must have sufficient time for such a project. The painter also needs it. He or she rarely knows beforehand how much time will be required. If he needs more time, then he must also take up more of the model’s time, which can be problematic when painting people who are in such high demand. It is for this reason that Yeo has developed a technique that allows him to work quickly when the subject is in front of him and, if necessary, from memory prompted by photographs when the person is no longer present. Our impression of a person is based on a great many different impressions. It is not only a person’s appearance that determines whether we can recognise him or her. What we call ‘appearance’ does not only constitute a characteristic face and a typical build etc., but perhaps also a particular way of dressing, how they converse, how they move, how they hold themselves and so on. A portrait by its very nature can allude only to some of these vital characteristics that together make up a person’s identity, so when a painted portrait powerfully conveys someone’s ‘being’ based only on the visual facts, it is a remarkable accomplishment. Jonathan Yeo has only his model’s appearance, often just their face, to build upon. Unlike the symbolically rich portraits of royalty and aristocracy from the seventeenth and eighteenth centuries, such as the painting of the triumphant Christian IV by Pieter Isaacz at Frederiksborg Castle, Yeo relies far less on traditional means of communicating someone’s status. His work frequently uses the face alone to convey someone’s identity, such as in his portrait of the actor and entertainer Stephen Fry, with his characteristic broken nose and kindly eyes. However, Yeo will also often include subtle visual devices to allude to someone’s identity, such as Tony Blair’s Remembrance Day poppy, or Malala Yousafzai’s book. These clues add strongly to the narrative of the painting, often by suggesting something about that person’s character, as in the Blair portrait, whose reputation as a warmonger is noted ironically through the poppy on his lapel, poppies being worn in Britain in November as a symbol of remembrance of those in the armed forces who have died in the line of duty. Occasionally Yeo chooses to depict his model in full figure, such as in the painting of his friend, the internationally renowned British artist Damien Hirst. Hirst came to the world’s attention with his sculptures of animals, such as sharks and cows, sometimes in a state of dismemberment or dissection, preserved in a tank of formaldehyde. The use of this particularly hazardous and carcinogenic substance to preserve the animals required the artist to don a chemical protection suit while working on the pieces. This rather peculiar-looking, even sinister, item of workwear playfully made its way into Yeo’s portrait of his fellow artist. Both the front-facing view and the suit, with its protective or diving helmet, make Hirst look like a king reigning over a very special kingdom: his own. People have a tendency to equate a lifelike portrait painting with a good portrait photograph, but there is an important difference. The photographer, however skilled or professional, can only hold, for a single fraction of a second, a total impression that stretches over a long period of time. They can go into Photoshop with the provisional result and perhaps make a particular picture clearer and better with the aid of one of the many image-processing programmes available. But the developments are not so advanced that they can simply let a snapshot of a moment glide over another in order to create one that is better and more complete than the two previous ones. In contrast, a portrait painter is able to sum up many impressions in one picture. This requires time and is why the painted portrait always comprises more than the model’s features. What typifies the artist who has executed it, and the process that has taken place will, in some imperceptible way, also be there in the picture. Such a portrait painter can be compared to a writer who wishes to describe a piece of nature, which they have in front of them. Because nature also changes. This writer can continue to alter sentences and replace words, until what can be read on their screen appears to be the best linguistic summary of what they have seen and want to describe. It is no longer possible to see what they have deleted during the process. In this way, in its deep layers of colours a portrait can house a wealth of effort, which was once visible, but which the artist has regretted and rendered invisible: either by painting over it or removing it with a spatula or a little turpentine. In his studio, Jonathan Yeo typically sits on an alarmingly high chair. From here he has a clear view of both his palette and his model. He quickly checks the person in the space, then the person in the picture to study whether the two are starting to resemble each other. The work consists not only of translating three dimensions into two, but also of summing up the many thousands of moments of painting into a single piece. For just as the artist is not completely the same person every single day of the year (in the sense that he is not always just as refreshed, rested, motivated etc. ), nor perhaps is the model. At the first session, a model can easily feel a little uncertain and self-conscious about the situation. However, by the next session, while the sitter might still feel a little unused to the environment of the studio, one of Yeo’s greatest strengths is having the ability to make people feel calm and at home thereby bringing out a different, more relaxed version of themselves. Although it is the same person sitting in the chair throughout all the sessions, they do not always appear the same to the painter. Nor is it certain that the painter appears the same from one time to the next to the model. Lucian Freud virtually denied that he did. A good portrait painter must take all of this into account. It is the likeness that legitimises the picture as a portrait. Likeness is the essential requirement that must always be placed on the contemporary portrait painter. The requirement becomes constant if the painter’s models are people with whom everyone is familiar, as is the case with the majority of Yeo’s models. A painter working in our present, obsessive, image-producing culture cannot hide behind his public’s lack of familiarity with his models’ actual appearance. On this point, the painters of previous eras had a much freer hand. The people who have sat for Yeo are, to an overwhelming extent, well-known figures. We know their names from newspaper columns and their faces from television, cinema and, not least, the oceans of images available on the internet and social media. Which cultural consumer today is not familiar with Kristin Scott Thomas, Jude Law, Helena Bonham Carter or Idris Elba? Their faces have become common property all over the world, and their appearance is arguably a crucial part of their celebrity and value as an actor. 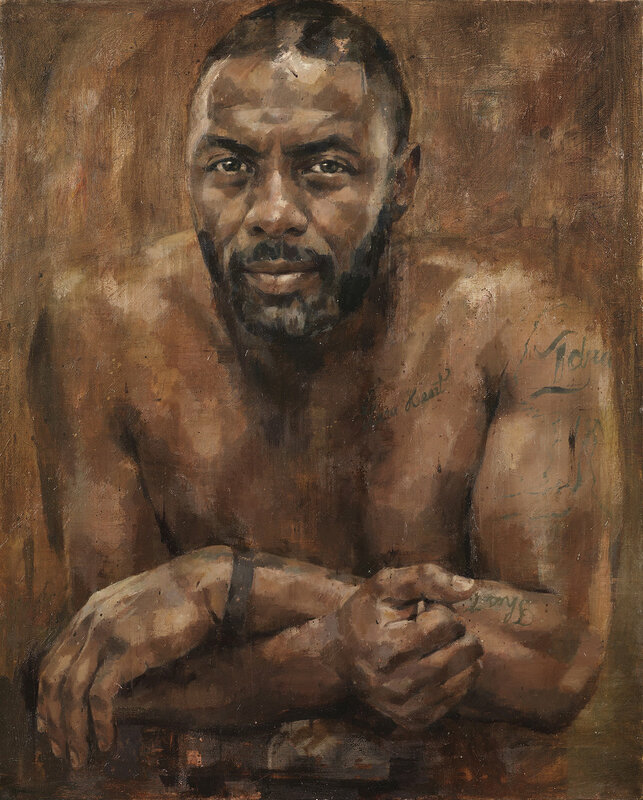 When painting actors, as Jonathan Yeo has done frequently, the task is a rather specific one as these are people who are used to putting on a performance and, therefore, painting the truest version of them becomes a much harder job. However, Yeo has embraced this difficulty by occasionally turning it on its head, such as in his portraits of Kevin Spacey. 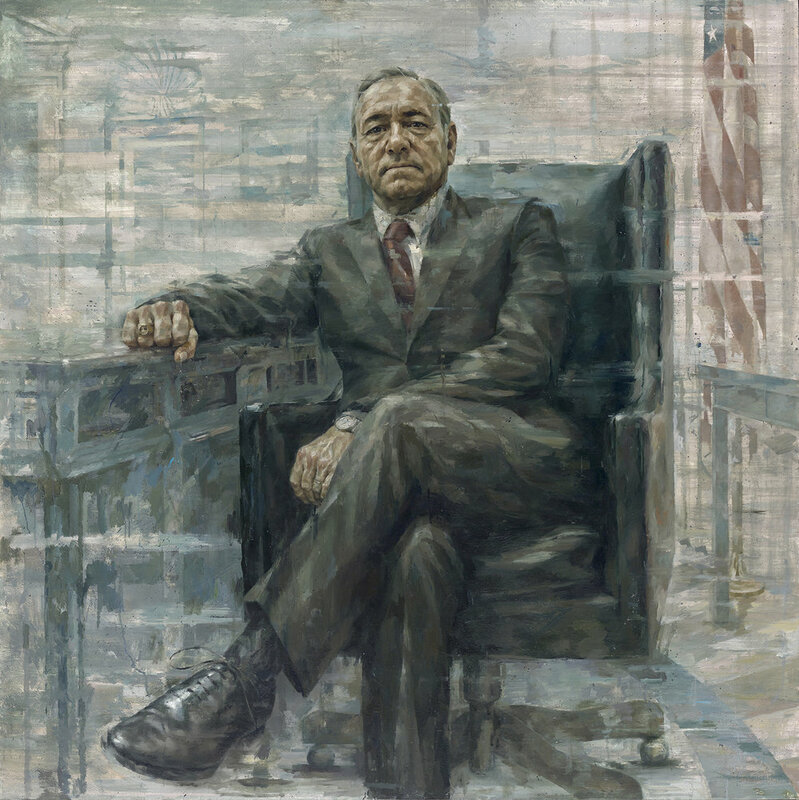 Having painted him in a number of roles, namely Richard III, whom he played on stage at the Old Vic Theatre, and President Frank Underwood from Netflix’s House of Cards series, for which the actor received a Golden Globe, Yeo welcomes Spacey’s ability to totally transform into such commanding and memorable characters. In fact, the actor, who is considerably more private than many of his colleagues, would much rather be portrayed in these guises. Not only do these masks allow him to keep a level of privacy from the portrait artist’s probing eye, but also when he is playing these roles he totally immerses himself in those characters, which are hard to leave behind at the studio door. Yeo, therefore, has to embrace whichever character he is at that moment, the result of which is the creation of a number of multifaceted and entertaining portraits. Jonathan Yeo’s portraiture can be divided roughly into two categories, the first being the small number of private commissions he takes on each year and the second being sitters whom he approaches having personally decided that he would like to paint them. The former type of collaboration begins with the model contacting Yeo through his studio. Though this generally takes place via one of the artist’s team members, it is Yeo himself who, in every single case, decides whether he has time to take on the job. In the past, he accepted many more of these enquiries, but today the number of such commissions has been reduced to three or four per year. He has always preferred to select the model himself, as in his paintings of artists and actors and, latterly, his series portraying the model and actress Cara Delevingne, all of which have narratives and explore thematic and conceptual ideas. Yeo has a self-imposed rule, which is to never take on a private commission before obtaining a first-hand impression of the person he is to paint. It could, for example, be that the artist, upon agreement, visits the model in his or her own home. It is not here that the person will be depicted, but a person’s immediate surroundings almost always tell us something important about the person themselves. Alternatively, the meeting might take place in Yeo’s studio in London. Nothing is fully decided when the parties meet for the first time, but it is usually a good sign if Yeo begins to take photos of the person to start getting ideas for the composition of the painting. It is in his studio that the subsequent sessions will take place. The fact that Yeo refers to these meetings as ‘sessions’ suggests that they have a certain character, and that they can sometimes be lengthy. In Jonathan Yeo’s studio, the model is able to meet a handful of faithful staff members, all of whom work for the artist. One answers external enquiries, another assists with making collages, one conducts research, for example by locating relevant photographic material, another prepares and under-paints the canvases on which Yeo will soon begin working, another finds the photographs that will be used for collages, while yet another is responsible for coordinating the entire enterprise. Each has their own area of expertise and works independently on the tasks they have been set. The majority of the current team have been at the Chelsea studio for over a year now. They know each other well and the demands that are placed on them. Needless to say, it is Yeo’s portraits that hold most of the visitors’ interest when they come to the studio. 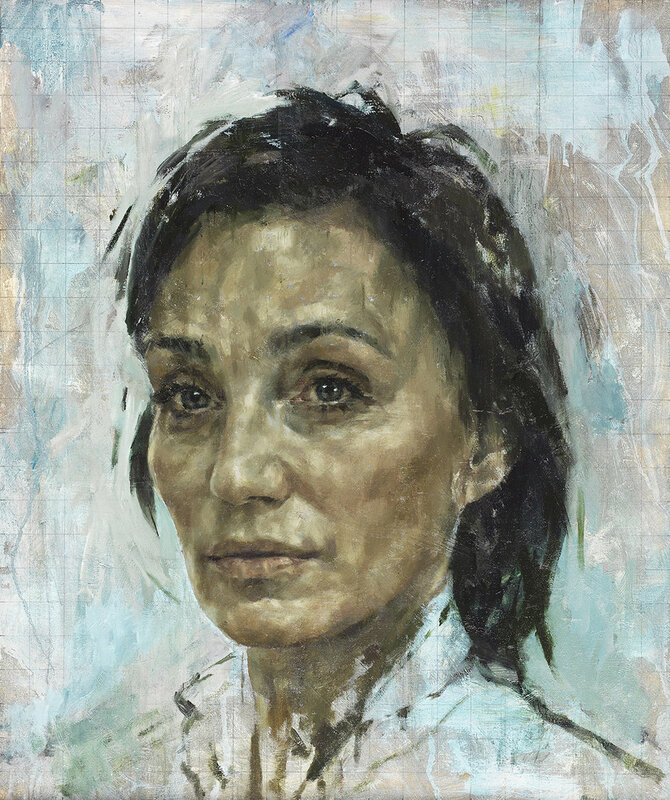 There can be no better ambassador for Jonathan Yeo’s studio than the pictures themselves, which leave the address at intervals to be exhibited in museums, galleries and private collections around the world. Like his friend Damien Hirst, Yeo has started to sell some of his works away from commercial galleries. If a painting is sufficiently convincing, in the sense of being lifelike, then an artist or an art dealer does not need to recommend it: in this case, the picture recommends the artist. The under-painting of the portraits is a special chapter in the creative process. Yeo does not like to start his work on a virgin white, completely unpainted canvas. He would rather have some kind of resistance right from the start: a pre-existing shape, colour or structure, about which he must make a decision, something that might stimulate him, and which he has to paint up to, or paint over. The thin layers of colour used for the backgrounds have become increasingly bold and more daring. The abstract nature of the layered background in Yeo’s newer paintings adds an element of discord when seen in combination with the figural work. Another essential part of the aesthetic of Yeo’s backgrounds is the finely drawn grid pattern, which he introduced about 12 years ago. This grid is the remnants of the drawn-on structure, which he uses to work out the composition of the painting. While this initially has a practical purpose, its geometric look becomes a painterly device and part of the aesthetic of the piece, as well as a visual clue to the painting process. The numerous small, precise squares create a clear contrast with the larger, softer and more painterly forms, which are his subsequent contribution to the painting as a whole. They also give a sense that there are many layers to the painting, and that each of these layers represents a plane of reality with its own specific function. In essence this is a practice that is reminiscent of the traditional, tiered working approach of the Old Masters, such as Leonardo Da Vinci and Jan van Eyck, with which we are familiar from descriptions in art history texts, x-radiography and other scanning techniques. Many important historic portrait painters used underlying grids of squares or a system of vertical and horizontal lines to help them manage the many proportional relationships in their compositions. However, unlike these Old Masters, to whom Yeo looks for lessons in this genre he has taught himself over the years, he is not afraid to ‘reveal’ the lines that are there to help in the construction of the painting, its hidden ‘scaffolding’, so to speak. In fact, he is particularly interested in the unfinished or incomplete paintings of the Old Masters, because such works can be considered the means by which Yeo educates himself in the practice of painting. All this contributes to what Yeo always strives towards in his work: that quality, which one could call the greatest possible likeness. In this context, likeness is based not only on identity, but also on proximity and presence. When this principle is put into practice, the word ‘portrait’ acquires a special meaning, and one starts to understand the logic of the word’s etymology. The word originates from the verb protrahere: the Latin for ‘to draw out’. This is what Jonathan Yeo does with his canvases. He ‘draws out’ the people whom he has met, so that we can meet them too. the portrait is made and takes shape. When these two have finally left the stage, the finished portrait remains as a reminder of a unique meeting that once took place.